The Union Cabinet chaired by Prime Minister Narendra Modi approved the ‘Pradhan Mantri Gramin Digital Saksharta Abhiyan’ (PMGDISHA) to extend digital literacy to 6 crore rural households today. 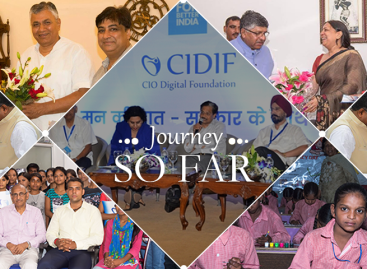 The allocated budget for one of the largest digital literacy programmes in the world is Rs.2,351.38 crore. The project is targeted to be completed by March 2019. The mission is in line with the announcement made by Finance Minister Arun Jaitley in the Union Budget 2016-17. Under this scheme, 25 lakh candidates will be trained in the Financial Year 2016-17, progressively increasing over the years to 300 lakh candidates in the 2018-19. To ensure proportionate geographical reach, each of the 250,000 Gram Panchayats would be expected to register an average of 200-300 candidates. The digitally trained personnel would be able to operate computers and other digital devices like smart phones and tablets, send and receive emails, browse internet, access Government Services, search for information, and undertake cashless transactions. The scheme would be implemented by the Ministry of Electronics and IT in collaboration with States and Union Territories through designated State Implementing Agencies and District e-Governance Society (DeGS). As the core focus area of the government is cashless transactions through mobile phones, the project curriculum would place emphasis on Digital Wallets, Mobile Banking, Unified Payments Interface (UPI), Unstructured Supplementary Service Data (USSD) and Aadhaar Enabled Payment System (AEPS). As per the 71st National Sample Survey Organisation (NSSO) Survey on Education in 2014, only 6% of rural households have a computer. PMGDISHA, which comes under Digital India Programme aims at empowering the rural citizens by providing them access to information, knowledge and skills for operating computers and other digital devices.